Some people are actually highly sensitive to chlorine bleach and the fumes it produces. Even if you are not, if you get a strong whiff of it in its pure form, it absolutely gets your attention. What's more, this product should not be used if your house is connected to a septic system. Why? Chlorine bleach is a fantastic sanitizer. It quickly kills bacteria. The trouble is, septic systems are filled with beneficial bacteria that break down waste. Pour chlorine bleach or products that contain chlorine bleach into a septic system and you can cause the septic system to malfunction. Chlorine bleach can also deteriorate fabrics and immediately take color out of them. I once was wearing some nice sweat pants as I was cleaning my shower one day. It was a quick cleaning and I thought I would be OK. Well, somehow I got a splotch of chlorine bleach on the pants and bingo, the navy blue pants have a nice magenta splotch right on the left thigh. An alternative product that works just like chlorine bleach, but not as fast, is oxygen bleach. Oxygen bleach is color and fabric safe. It is also safe for use in septic systems. In fact, it helps septic systems by adding needed oxygen within the actual tank. You can buy oxygen bleach in many places. It is sold on cable TV, I have seen it in membership stores, and I have recently seen it in a large grocery chain in my city. I also sell it. The trouble is not all of the products are the same. Many of the ones sold on TV and in the stores have fillers in them to extend the product. 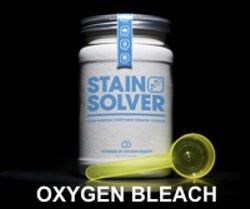 My Stain Solver oxygen bleach is 100 percent pure. You need less of my product to achieve the same results you get with the also-rans. I decided to create my own special blend using ingredients made in the USA. In fact, the raw materials in the active ingredient are food-grade quality registered with the FDA. I call my product Stain Solver. I urge you to use it to help with your cleaning needs. You will be amazed at the results!